1067 clips, 20 categories on 25 DVDs. Wedding Essentials Vol 1-6 standard and Write-On Titles Vol 1,3,& 4. Worship Series 1- 14 volumes- standard. 101 transitions to add fun to your videos. 57 flourish designs to add a comtemporary flair. 75 globe elements to add a network quality flair. 42 useful animations to easily give your video an aged look. 32 crystal clear overlay animations for compositing. 40 looping animations for hip design. 36 eye-blasting backgrounds to stimulate your video. 56 highly combustible overlay animations. 36 amazing water animations that all loop seamlessly. 84 visually stunning shape-shifting background videos. 42 useful video animations to add network quality flair. 40 jaw-dropping video animations covering travel and theater. 52 animations covering all life’s momentous events. 50 adorable animations for your baby videos. 25 one of a kind baseball animations. 44 flourish motion graphic clips including 6 lovely sets. 50 modern motion graphic clips including 6 distinct sets. 65 satin and lace backgrounds including matching lower-thirds. 48 stunning clips, including openings and closings. 56 fresh new background videos in 5 wedding themes. 48 tasteful animations to add elegance to your wedding videos. 44 high-definition animations to add style to you HD wedding videos. 49 high-definition animations to add style to you HD wedding videos. 48 high-definition animations to add elegance to your wedding videos. 20 soft blending motion clips perfect for song lyrics. 15 motion clips that capture the beauty of a spring garden. 20 beautiful ocean scenes shot in HD, perfect for song lyrics and scripture. 20 majestic mountain scenes shot in HD, perfect for song lyrics and scripture. 20 powerful motion loops all for Easter. 20 motion backgrounds for Easter and other spring & summer holidays. 20 subtle, soft background videos perfect for song lyrics. 20 rock solid clips sure to enhance your message. 20 motion backdrops to give life to your holiday services. 13 countdowns to create anticipation. 20 fire animations when you must depict the symbol of fire. 20 easy-flowing backgrounds to enhance your message. 20 heavenly clips to captivate your congregation. 20 motion backdrops sure to enlighten your service. 150 scripted wedding titles that appear to write themselves onto the screen. 150 scripted special events titles that appear to write themselves onto the screen. 150 scripted spanish wedding titles that appear to write themselves onto the screen. 150 scripted Quinceañera titles that appear to write themselves onto the screen. 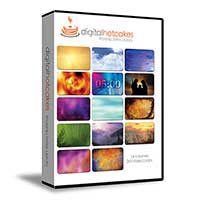 Digital Hotcakes are video loops, background video, video animations, video transitions, motion graphics, video overlays, and 3d animations. Whatever you call them, these animated video loops will instantly enhance your video production or presentation.